The primary aim of this course is to provide a sound and concrete foundation for professional cookery knowledge to trainees with emphasis on the preparation and presentation of menus, various dishes, and sauces and garnishes in order to create customer satisfaction. The importance of the customer has been blended in an appetizing culinary way to come up with professionally well-trained personnel to make this a reality. Apply various cooking methods at any given time without difficulties. Develop knowledge and understanding of commodities and how to select for quality, cost, availability and to compare fresh, part-prepared, commercial and convenience products. Understand recipe balance and to be able to follow recipes to produce dishes of the required quality, colour, consistency, seasoning, flavors, temperature and presentation. Comprehend fully the essential necessity for healthy, hygienic and safe procedures at all times in the preparation, storage, cooking, and serving of food. .
Cater comfortably for vegetarians and vegans. Who Will Benefit From Food Production Course? 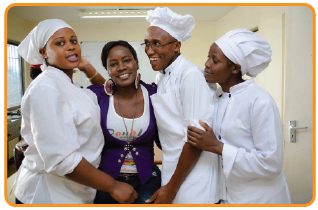 The Food production course will benefit trainees who wish to make a career in the hospitality industry and who plan to work with hotels, restaurants and catering establishments initially as cooks and depending on experience, further training and Hard work coupled with dedication, aspire to positions of higher responsibility such as Chef-de-Partie, Cher Tournant, Sous-Chef eventually Executive Chef.